Thank you for visiting our webpage about how we can assist you and your clients. You may be familiar with Dr. Winifred Bragg through one of the webinars or seminars she’s conducted for Case Managers throughout Hampton Roads. If so, you know that Dr. Bragg is an expert in providing non-surgical treatment for injuries and pain resulting from spinal and orthopedic conditions. You also know she is very passionate about Case Managers thinking first about non-surgical treatments before referring a client to a surgeon. Many Case Managers in Hampton Roads refer their clients to Dr. Bragg at either the Spine and Orthopedic Spine Center in Norfolk or Chesapeake because of their experience and success with her non-operative treatment of spinal and other orthopedic problems. We hope you’ll get to know us and consider us as a trusted referral source too. When your clients have work injuries resulting in disk herniations, neck and back pain, shoulder or knee pain, we hope you will consider Dr. Bragg and the Spine and Orthopedic Spine Center as a first choice for their treatment. Cindy Crumley, RN, CCM, Case Manager, Professional Rehabilitative Options, Inc.
We are thrilled that you visited our website. 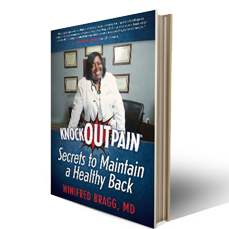 If you would like to talk with Dr. Bragg or meet with her, please contact us at (757) 333-3360 or info@knockoutpain.com.